Breakfast time was never my favorite growing up. I was (most of the time am still) not a morning person & as I kid, I spent many a mornings at our dinner table struggling to stay awake to eat my oatmeal. 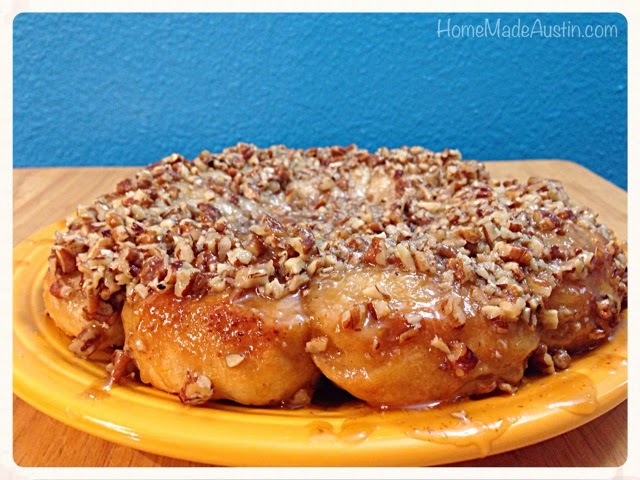 But every once in a while, on a special morning, my Mom would make sticky buns. And they were often the breakfast I'd request for the morning after sleepovers & slumber parties at our house. They were always a treat, & even now, still make breakfast pretty special. 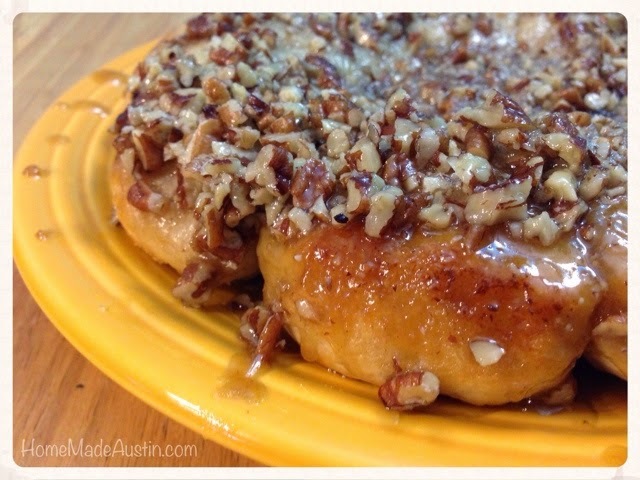 This morning, I woke up with a craving that only the sweet, sticky, pecan jeweled sticky bun could fill. And this recipe is so easy, you can get it in the oven before the coffee's even ready. Start by preheating the oven according to your can of biscuits directions. Slice the 1/4 cup of butter into the bottom of a pie or cake pan & place in the oven, just until the butter is melted. Once the butter is melted, remove from oven and add brown sugar & syrup and mix together with a fork or small whisk. Add in pecans & stir together. (I used about a half cup of pecans this morning...but in my family, the more the better, so just use as many as you'd like). Open tube of biscuits and arrange directly on top of the pecan mixture. Bake according to the biscuit can directions. Remove from oven once baked & quickly, but carefully, turn over onto a large plate or platter. See, told ya it was easy. 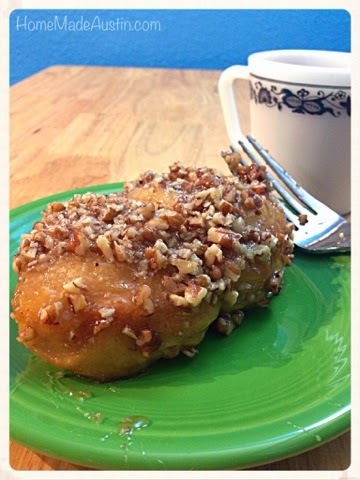 The biscuits come out extremely soft, and the slightly sticky, caramely sauce goes perfectly with the pecans. It's a match made in Sunday morning breakfast heaven!